You are here: Home / Dream Stories / Addison’s family road trip! Thank you to the Horkey family for this amazing story of their experience being the parents of a sick child and the impact that Westman Dreams for Kids has made for them! As a community we are able to accomplish great things, thank you Westman! Our daughter Addison was born in November 2008 with a heart murmur that the attending physician felt she would grow out of. Addison was always a happy active child, although in hindsight after learning what we have about children with Congenital Heart Defects, she was tired more often than most kids, luckily though that seemed to be the extent of her outward symptoms. In October 2014 Addison came down with a chest cold, she had a hard time getting over, and a routine check up turned into a life changing experience. She was quickly scheduled for an Echocardiogram in Brandon which was followed up with two more in Winnipeg in February 2015. Our happy active little girl was very sick. She was diagnosed with Patent Ductus Arteriosus and Ventricular Spatial Defect, two holes in her heart. After getting Addison’s diagnosis we found out that we had an amazing support system of friends in place. Among other things someone anonymously contacted Westman Dreams for Kids on Addison’s behalf. About a month before Addison’s surgery, we met Susan from Westman Dreams for Kids and she explained that someone had contacted the organization and told them about Addi and what she was going through, and they wanted to grant her a wish! Our six-year-old, obsessed with princesses and Frozen asked for and was granted a trip for her family to Disneyworld! 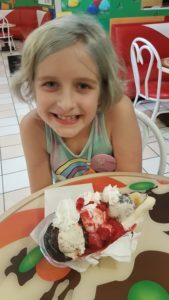 We decided to hold off until after her surgery and follow up appointments to go as a way for Addison and our family to celebrate her health, which Westman Dreams was entirely understanding and accommodating about. In June 2015 we travelled to Stollery Hospital in Edmonton Alberta, where Addison underwent open heart surgery to repair both holes. It took until July 2017 to find out that her patches were healing properly or as she put it her heart was fixed. We decided the time was right to go ahead with her wish, we picked mid November for a warm get away. We met with Susan again and got things moving. 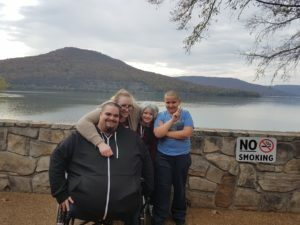 We decided to drive to Florida as a family of four for an amazing road trip that was a wonderful experience. Somehow it made the entire trip seem so much more magical, we got to see and explore several states along the way. along the way we literally watched the seasons change in the span of three days. We arrived at Give Kids the World Village on November 13th and we were literally blown away from the moment we got there. This place is a whimsical resort for families of sick and critically ill children to relax and enjoy themselves. It’s entirely all inclusive and 100% kid friendly. The villa’s are beautiful and they go all out with their nightly theme events for families staying in the village. We took part in Halloween, Christmas and The Birthday bash. They also have several things to see and do in village. Including an arcade and a few carnival rides, we had to stop at the Merry-Go-Round at least once a day, but usually two or three times. A huge heated outdoor pool that we spent most of our first day at with free hot dogs and slushies, and our kid’s favorite thing to do in the Village, the Ice Cream Palace. It’s an ice cream shop that will make you anything you want from a split to a milkshake, any flavor, any toppings, and it’s all free and you can go as often as you want. Given all the things to see and do at Give Kids the World it’s almost hard to convince yourself to go to the actual parks. 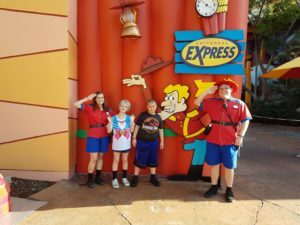 We had 3-day passes to Disneyworld, 2-day passes to Universal Studios, 1-day pass to Sea World and if you can find the time and energy you can add a pass from an optional Orlando attraction as well. We took in Magic Kingdom, Animal Kingdom and Hollywood Studios. We spent one Day at Universal Studios and one at Sea World. We also took in an optional attraction, we went to the Orlando Eye, a 400-foot-tall Ferris wheel and Madame Tussaud’s Wax Museum. 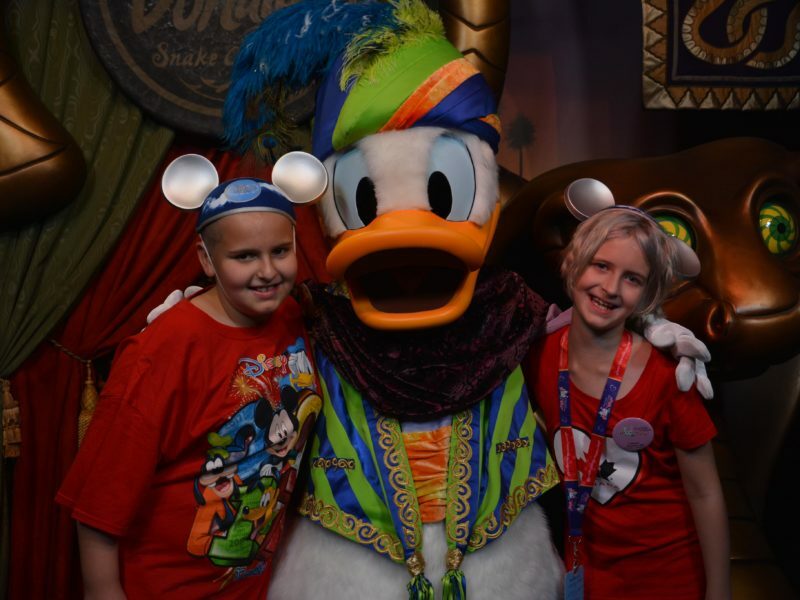 It’s hard to pick out just a couple of our favorite memories, there are so many, we loved the Seven Dwarfs Mine Train, the Barnstormer and Under the Sea, meeting so many characters, and the Happily Ever After fireworks at Magic Kingdom. The Primeval Whirl and Expedition Everest, the It’s tough to be a bug! Show, and the Night Time Safari at Animal Kingdom and Tower of Terror at Hollywood Studios. At Orlando it was all about getting wet! Dudley Do-Right’s Ripsaw falls and Popeye’s Bilge and Barge, The flight of the Hippogriff and the Simpsons Ride, we also really liked the Transformers ride and Harry Potter area of Universal studios, and The Killer Whale and Dolphin show at Sea World. Addison was easily the biggest thrill seeker of our family, often pulling someone onto a ride that would either drop, spin or both at every park, sometimes more than once. It’s difficult to put what this trip meant to us as a family in a few words, it was a celebration for Addison, an affirmation of humanity from complete strangers who wanted to make a little girl feel better, a once in a lifetime experience for the entire family and a happily ever after for us as parents. Thank you Westman Dreams For Kids, for granting her amazing wish, it was a once in a lifetime experience that we have nothing but fond memories of and continue to talk about all the time.